Welcome to the Mecoptera Page. The Mecoptera is a small order of insects that is thought to be ancestor to the higher insects. Insects of this group are commonly refered to as "scorpionflies" because of the structure of the male genitalia. In the family Panorpidae, the male genitalia is bulbous and recurved and looks very similar to the sting of a scorpion! 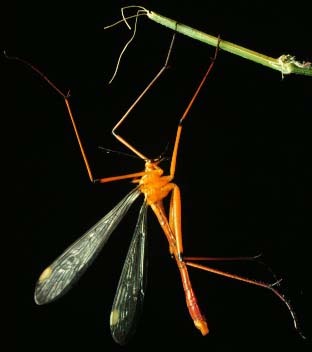 Members of the order Mecoptera are most easily recognized by their long-faced appearance due to their chewing mouthparts being at the end of a long beak. The Mecoptera also four membranous wings when present. In many species of the family Panorpidae the wings distinctly colored. There are four families in North America: Boreidae (Snow Scorpionflies), Meropeidae (Earwig Scorpionflies), Panorpidae (True Scorpionflies), and Bittacidae (Hangingflies or Hanging Scorpionflies). In California there are six species of Mecoptera and these are represented in the families Boreidea (2), Panorpidae (1), and Bittacidae (3). The image shown below is the California snow scorpionfly, Boreus californicus Packard, native to the western United States and common in the Sierra Nevada Mountains of California where they adults are found on moss covered rock outcroppings from November through February. The larvae are found apparently feeding in the moss. There is another species in the San Jacinto Mountains of southern California, but it is very rare. 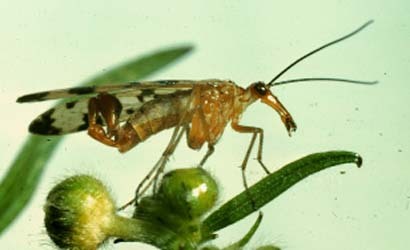 The image shown below is a scorpionfly in the genus Panorpa taken by Paul Tuskes somewhere in the Eastern states. Scorpionflies are active during the summer months depending on the area. They prey on many softbody insects. There is only one species belonging to this family in northwestern California and southwestern Oregon. Members of this family are usually yellowish to light brown in color and resemble crane flies, except that they have four wings. These insects are commonly called "Hanging Scorpionflies or Hangingflies" because the adults spend most of their time hanging from twigs and foliage with their raptorial front legs. While hanging the adults are often seen devouring their prey which they hold with their raptorial hind legs. There are about a dozen species of Bittacidae in North America. The image shown below is that of Apterobittacus apterus MacLachlan. This wingless hangingfly is only found in central California during April and May. It preys on softbody insects. 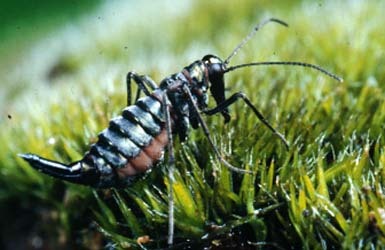 The image shown below is that of Bittacus chlorostigma MacLachlan. This is largest species in the genus Bittacus and it is easily recognized from all other species because of the large yellow spot on the stigma of the front wings. It is found along the western foothills of the Sierra Nevada Mountains of California and perhaps in southern Oregon. In Central California, this species is found active from late March through early June in grassy woodlands. They prey on many softbody insects smaller than themselves. I don't have a digital picture of the next species, but maybe one of these days I will. Orobittacus obscurus Villegas and Byers is the third California species in the family Bittacidae. It is found in the Central California mountains near where gold was discovered in California. It is active from mid May through early July. 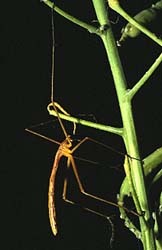 This species is crepuscular in habits and during the day it hangs from spider webs in protected, darken areas such as ledges, small caves, down timbers, etc. It feedsalso on soft bodied insects smaller than itself but it shows a marked preference for crane flies.